First we see a request (and response) for the device descriptor. In this device descriptor, you can also see the indices for the Manufacturer, Product and SerialNumber string descriptors: 1, 2 and 3. A bit later in the capture, you'll see a request for a string descriptor (type 3) with index 0: that actually means an inquiry for the languages used for the string descriptors. 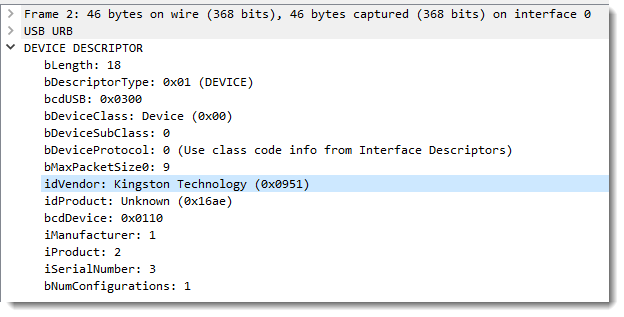 I invite you to test out Wireshark's USB capture with different USB devices, and post a comment with your findings.